How Cruel is my Makeup Bag? When we talk about animal cruelty, we tend to think of neglected cats left to starve, or dogs forced to fight getting horrific injuries. However, animal cruelty isn't something that's just brought about by a handful of awful people - there are labs dedicated to using defenceless animals to test beauty products. These animals are forced to ingest some ingredients, have it injected into them, plopped into their eyes, or put on their skin, leading to illnesses, rashes, blindness and an altogether miserable life. Recently I've been thinking a bit more about the ethics in my life, particularly towards animals. I'm an animal lover (especially towards furry ones that appreciate a cuddle! ), and because of this I felt it was hypocritical of me to disregard animal cruelty in the beauty industry. I've seen a few bloggers and YouTubers finding out how cruel their makeup bags are, by looking at the various products they have in there and whether or not the products or their ingredients were tested on animals. I wanted to do this myself, so I know which products to find an alternative for when they run out, and writing about it here will help get this message out to my readers. It really isn't that hard to research, and I'd encourage all of you to consider going cruelty free - it's possible, doesn't have to be expensive, and means you can use your makeup knowing that you've avoided this unnecessary harm and distress towards animals. This primer does a really good job of making sure my face is prepped for a smooth application of foundation that will last all day. A little goes a long way as well, so I'm a big fan of it! Knowing that it's cruelty free is good, since I really don't know where I'd go for a new primer that does just as good a job. Yes, Elizabeth Arden test on animals. I won't be repurchasing my foundation, even though it's nice to use. I'm currently looking for a cruelty free alternative. This is the only concealer I've ever found that's actually pale enough for my skin, so thank goodness it's cruelty free! I find it easy to blend and it doesn't smear or crease as well which I really appreciate. I used to use Rimmel Stay Matte powder because everyone raves about it, but I found out that Rimmel aren't cruelty free and it was the first product I didn't repurchase purely because it's cruel. This powder does just as good a job without hurting anyone, so safe to say here's one I will repurchase! I don't use bronzer or contour a lot, but when I do I use Benefit. Unfortunately, it's cruel, but that's not much of a blow since a rarely use it. It's a shame, since Benefit do some beautiful packaging and good products, but their practices are ugly and I'm not giving them my money. I got this blusher free with a voucher so I wouldn't have minded horribly if I couldn't replace it, but it's a nice shade on me and a good product that I use often. Makeup Revolution are brilliant. Their eyeshadows are beautifully pigmented and blend really nicely, and their other products are no exception to this quality that I expect. On top of this, they're really inexpensive so I recommend the brand regularly knowing that people will get quality products without breaking the bank! Freedom are part of Makeup Revolution so they're cruelty free as well. This brow product cost me £1. It's pigmented, and lasts all day, and my pan is still practically full after about two years because you don't need much. Urban Decay themselves are cruelty free, however they're owned by L'Oriele, who aren't. Because of this, your money does go towards a bad company, however the vast majority of it goes to Urban Decay who create high quality products without testing on animals. Obviously if you don't think this counts, don't include it as cruelty free. My favourite eyeshadow palette at the moment is Morphe's 30f Fall Into Frost, so I'm relieved to know they don't test on animals. This palette is pigmented, blendable, and long lasting. Thank goodness this eyeliner is one I can repurchase. It's brilliantly pigmented, easy to use, doesn't smudge, smear, or transfer through the day, and is just a really good product in my opinion. I like this mascara a lot. It makes my lashes appear fuller and longer, and it's the mascara I reach for every day. I'm sad that this is cruel, since it's pigmented and nice to wear, and they have a lot of nice shades. However, I care about animals more than a product with many many dupes, so I'm not repurchasing any of their products. Shame. I like this lip butter. It's moisturising but still offers a nice colour and they have a huge range of shades. However, that's not worth the suffering of animals. At least one of my lip products is cruelty free. This lisptick is gorgeously pigmented, not drying, and it lasts a long time without smudging. At least I have over twice as many cruelty free products as cruel ones. A quick google search can help you find out whether a brand is cruelty free or not, but if you want to use an app I'd recommend Bunny Free. I'd be interested to see people like Zoella and Tanya Burr doing posts/videos like this one. They have very large audiences and it would be great if they would promote more ethical beauty practices to the masses! However, at least my (albeit smaller) group of readers will hopefully be a bit more aware of this issue and shop smarter in the future! Do you shop cruelty free, or will you after reading this post? 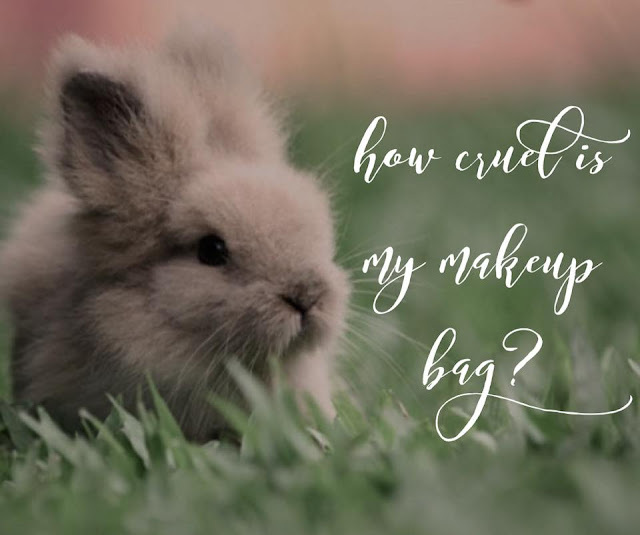 Let me know in the comments how cruel your makeup bag is! If you've done a similar post, I'd love to read it!